Not because of who the guest is (the amazing Arick Russell) but because Stephen shows up in a neck brace — check it out on YouTube now and see for yourself. But back to Arick. We’ve featured superstar trader Arick Russell before, and we got into the nitty-gritty of how he found his way and developed a style as a trader. This was one of our most popular episodes to date, and plenty of listeners have requested him back. 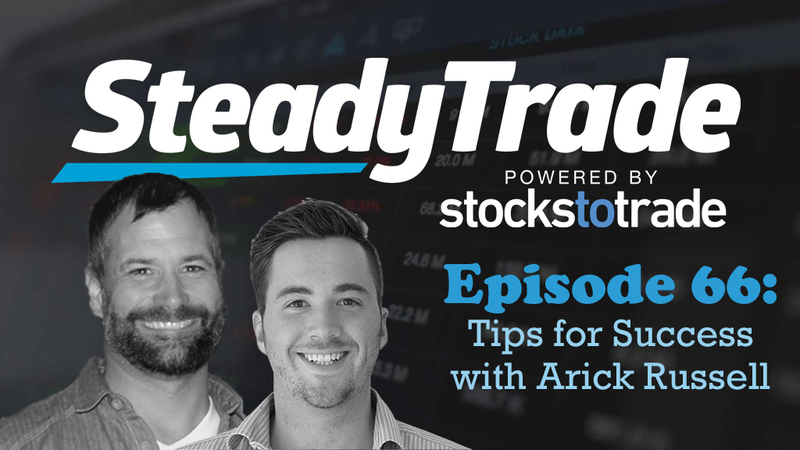 We listened, and this time, Arick shares his key tips for stock market success. What’s been going on with Arick? 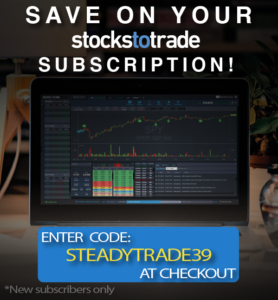 He speaks about one very interesting development: how he’s begun using penny stock strategies to trade bigger stocks, including IPOs (initial public offerings). Why use this method? For one, it lessens your emotional response and stress. For another, it’s accessible to penny stock traders. As Arick reveals, you can even use this method with a small account. This method developed from his desire to maximize opportunities and make profits every day. So if the penny stock sector isn’t moving, he wants to have an option for something else to trade. This is his way of taking advantage of the trends and movements of the market. Consider options. Want to grow a small account? Try trading options. Arick talks about his experience and how he has profited from this trading method. Don’t look for the “holy grail” indicator. Every trader asks: What’s the main indicator I need to know? What should I be using on StocksToTrade to figure everything out? Unfortunately, there’s not one answer. It takes time to go through the process, and you’ll find what works for YOU. You’ll hear Arick’s breakdown and he’ll share his thoughts on popular indicators like VWAP and more. Don’t be arbitrary. Arick talks about position size. Where should you position yourself, and how do you know when to add to your position? Make sure you have a plan. Don’t just choose a number. Look at the big picture and have conviction in your setup. Take “good news” with a grain of salt. Don’t believe the hype. Always do your own research and look at the charts, because a lot of company news is actually self-serving. You’ll learn about how to read between the lines on a press release. Penny stocks can be tricky. Penny stocks can seem glamorous. But in spite of what you might see on Twitter, they’re not regularly making people 200 percent a day. So it really has to be a good trade to get into the game. Arick talks about how to approach a penny stock trade, looking at trends rather than just potential profits. Getting into higher-priced stocks. He talks about getting into higher-priced stocks if you’re a penny stock trader. How to watch the market first, and what to look for that can serve you well. Be flexible. Don’t be so biased that you only do one thing as a trader. Yes, you should focus on what works, but when it’s not working, don’t force it. Lose the bias; not everything is black and white. If the market shifts, be able to shift with it. Don’t rush out the gate. Crazy things can happen directly after the market opens. “Avoid the first 10 minutes like the plague,” advises Tim. “Be patient,” says Arick. Don’t trade all the livelong day. Arick talks about the psychology of morning losses and the FOMO that makes you want to “catch up” — this is exactly when you MUST walk away from your computer. Technical versus Fundamentals. What’s more important: technical or fundamental research? While Arick identifies as a technical-based trader, he talks about the importance of fundamentals too. You may be surprised by what he says! Do it because you love it. Anybody can try trading, but few will succeed. If you want to be a success story, do it because you’re passionate. Very good information and informative. Excellent!!! I agree with Stephen; this should be a trilogy. Wish Arick went further with his 4 key indicators. I believe I only heard the one, VWAP.